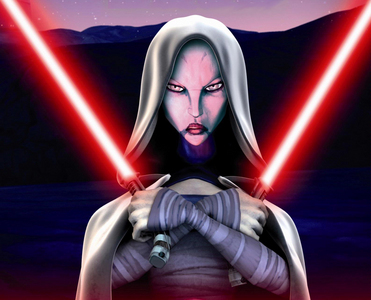 would bạn be a jedi hoặc a sith? so who is awsomer. Ahsoka hoặc Anakin? Out of Anakin and Obi-Wan, who did bạn feel sorry for the most after losing the tình yêu of his life? người hâm mộ lựa chọn: Obi-Wan after the death of Satine Kryze. I've been curious about when exactly Ahsoka started to carry 2 lightsabers. Did I miss something? If anyone knows the answer to this câu hỏi it would be greatly appreciated. Thanks. after maris brood turns the fulucians( idk if i spelled that right lol) to the dark side in ngôi sao wars, the force unleashed, do ever turn good again? Nakoma was sitting on a ship one ngày thinking after a mission. She wanted more. Yes, she LOVED what she did for a living, but she wanted to find someone, fall in tình yêu with that person, and start a family. She wanted an actual life. She didn't want to be a single Jedi forever. Yet she knew attachments weren't allowed in the order. She sighed knowing she'd have to wait as she went in the cockpit to be with Anakin. Nakoma sat nervously in the Jedi head quarters. She knew she was in DEEP trouble. Anakin was angry at her for doing such a thing. Obi-Wan couldn't believe she didn't listen. Padme tried her best get over the shock. What exactly DID Nakoma do, bạn might ask? Secretly go out with a Sith Lord! Matchstick, Tag -> Part of Anakin's vàng Squad died "Shadow of Malevolence"
Droidbait, Cutup, Heavy, Echo, and Fives -> Season One Disc One "Rookies" (except Droidbait) and Season Three Disc One "Clone Cadets" ; with additional appearance for only Echo in Season 3 Disc 4... see following: Cutup killed bởi giant eel, Heavy sacrificed himself, Echo killed defending getaway ship "Citadel Rescue"
Another massive quake shook the shrinking landmass so hard it chẻ, phân chia, split in two with water rising to engulf both the TWILIGHT and everyone outside. "I think we'll have to grow gills soon," chim hoa mai, chim ưng, finch đã đưa ý kiến trying to lighten the mood. Ahsoka smiled but Anakin didn't. He hadn't đã đưa ý kiến a word since the loss of Eagle and Raven. Sinube was down in the medical vịnh, bay treating Rex and Coric. One-Who-Sees remained on the bridge but the rest of his people were helping Sinube. The TWILIGHT touched down in a canyon surrounded bởi trees and a small stream. Charlie Brown was sitting in his beanbag one ngày looking for something to watch on TV. He flipped through the channels continuously. Just when he was about to give up, he saw a cool looking spaceship. "WOW!" he gasped in amazement. A tiêu đề of the hiển thị came across the screen. It was called "Star Wars: The Clone Wars". Charlie Brown kept it on this channel as his eyes grew big. "Easy, Rex, just guide the 'NIGHTMARE right over the hàng đầu, đầu trang of the TWILIGHT," Anakin đã đưa ý kiến to him, "Ahsoka is in the cargo vịnh, bay ready to grab bạn guys when bạn leave the gunship. Make sure your helmuts are on. There's alot of debris in the air." "Master Sinube, keep the the ship steady. I'm going to help Ahsoka," Anakin đã đưa ý kiến to Sinube gesturing to the old Jedi to sit in the pilot's seat. The best trích dẫn from The Clone Wars. a poll đã được thêm vào: Favourite Jedi Youngling From The Season 5 Group?